In celebration of its 150th anniversary in Holly, a brief history of Holly Lodge No. 134 was featured in the 2012 Kiwanis Goodfellas’ edition of the Holly Herald-Advertiser. Download the PDF scan of the article. Masonry is the art of building, the arrangement and joining of bricks to form a usable, common mass. 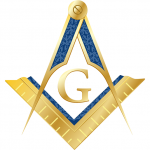 Freemasonry is building of a different sort; the fraternity of Freemasons, based on the symbolism of the building of King Solomon’s temple, is engaged in the building of morality and service in men, and by extension the building of communities like Holly. This year, Holly Lodge No. 134, Free and Accepted Masons, celebrated its 150th year of existence in the Holly community. Chartered in 1862, members of Holly’s Masonic Lodge have been integral in building and advancing of our community; many of their names are emblazoned throughout Holly, and many more have likely been lost in the fog of history. Holly was settled in the mid 1830’s, and became an important center of transportation and commerce with Henry Howland Crapo’s railroad endeavors by the early 1860’s. In 1861, eleven men from area Masonic Lodges came together to form Holly Lodge No. 134. By the end of the year, the Lodge had 24 prominent and able members, and in January 1862, the Lodge was granted its charter by the Grand Lodge of Michigan. Of the early Freemasons in the area, few were as prominent as Bela Cogshall, a farmer from New York. Cogshall settled on a tract of wild land in Springfield Township in 1836, paid for through savings earned by teaching. Cogshall joined Fentonville Lodge No. 109 in 1850, and after a year he helped found Austin Lodge No. 84 in Davisburg. He also began reading law and was admitted to practice in the area. Cogshall’s interest in education followed him to Holly, where he located his legal practice in 1867. He served as Director of Holly Schools and President of the School Board, as well as Village President and Justice of the Peace. From 1869-1870, he served in the State Legislature, and had also been Sergeant-at-Arms in the 1850’s. His leadership in Freemasonry was exceptional—he was a founder of Holly’s Chapter of Royal Arch Masons (R.A.M.) in 1871, Holly’s Council of Royal and Select Masons (R. & S.M.) in 1873, and led the movement on the statewide establishment of a Grand Chapter, Grand Council, and the Grand Commandery of Knights Templar. He was Worshipful Master of both Austin and Holly Lodges, High Priest of the Austin and Holly Chapters, and Thrice Illustrious Master of the Holly and Austin Councils for many years, as well as serving in numerous Grand Offices. Cogshall’s son, Bela Jr., was also a prominent Holly Freemason and served as Worshipful Master; he was a pioneering physician and oculist, leading many local and national medical organizations, including the Cogshall Sanitarium of Chronic Diseases in Flint, and serving as the health and sanitary editor for the Flint Democrat and the Globe. The office of the Village of Holly President is no stranger to Freemason leaders. In addition to Cogshall, James Simonson, a local businessman and banker and one of the charter members of Holly Lodge, served as the first Village President upon incorporation in 1865. James H. Cummins, a gallant officer in the Civil War, was a member of Holly Chapter No. 80, R.A.M., and served as Grand High Priest of R.A.M. in Michigan as well as Most Illustrious Grand Master of R. & S.M. in Michigan. Cummins was Village President when the waterworks system was built in response to a rash of fires. Holly was the first village of its size to have its own water system. Nearly a century later, Freemasons Bruce and Keith Dryer would also serve Holly as Village President (with Bruce and father John serving as Worshipful Master of Holly Lodge). Freemasonry was a legacy in another prominent Holly Township family, the Pattersons. Thomas Patterson, was a prominent attorney who joined in practice with Holly Lodge charter member James K. Patterson (unrelated) in Pontiac. James K. Patterson would later go onto be Oakland County Prosecutor, and Thomas served as Holly Township Supervisor and Judge of Probate for Oakland County. Both Thomas son William Fulton would serve as Worshipful Master of Holly Lodge. The Patterson ancestral lands, just a mile north and half-mile west of the Village of Holly, still host the name of the several schools founded there: Patterson Elementary School. Historical records indicate that the first Hall of Holly Lodge was dedicated in 1862, but was lost to a fire in 1863. Until 1870, there is no record of where that building was or where Holly’s Freemasons met until local banker and businessman James M. Baird invested in the Balcony Block building—Baird’s Opera House. One room of the third-story of the opulent building was home to Holly’s Freemason, for 57 years, until it was itself ravaged by fire. Just a block north on Broad Street, Freemason John Hirst built the Hirst Hotel in 1891, which is now known as Holly’s most famous and renowned historical landmark, the Holly Hotel. The Hirst Hotel and Baird’s Opera House were the center of social life in turn-of-the-century Holly, and it’s rumored that Hirst’s cigar-smoking ghost still roams the halls of the Holly Hotel. Following the opera house fire, an opportunity arose to purchase the old Christian Church on Washington St., then owned by the Knights of the Maccabees. After meeting in the gymnasium of Holly High School on College Street while the building was prepared, Holly’s Freemasons moved into their new building in September, 1927, where they still meet to this day. Even after 150 years, Freemasons in Holly continue to build the community through public service. In 2012, Holly Lodge No. 134 sponsored its first Bikes for Books reading contest in Holly Area Schools, where elementary students read dozens of books and six students won new bikes and helmets. Freemasons also provide free Child Identification Kits at Community Play Day, and tend Grange Hall Road through Oakland County’s Adopt-a-Road program. Numerous Freemasons continue to hold public office and volunteer in the community, a testament to the Fraternity’s affinity to leadership and communal service.